USA Hockey Model Associations like the Orchard Lake (Mich.) United Hockey Association are using The Hockey Intelligym as part of their training routine. Hockey sense or “Hockey IQ” is frequently attributed to some of the best players in the game. Current NHLers like Sidney Crosby and Pavel Datsyuk, as well as former greats like Wayne Gretzky, are credited with possessing off-the-charts hockey sense. While focus naturally turns to top-tier professionals who exhibit these abilities, it has become more commonly accepted that Hockey IQ is actually developed and honed at the youth levels. In fact, according to Bob Mancini, regional manager of USA Hockey’s American Development Program, players at the Peewee level can and should begin to develop these skills through targeted training. “Peewee hockey players are at the age where they are developing the cognitive ability to read situations, react to the play and make decisions on the ice,” said Mancini, whose coaching resume includes time spent in the NCAA and the National Hockey League, as well as with USA Hockey’s National Team Development Program. The ADM is based on the principles of long-term athlete development, which holds that certain aspects of children’s developmental stages must be addressed at the appropriate times in order for kids to reach their genetic potential. 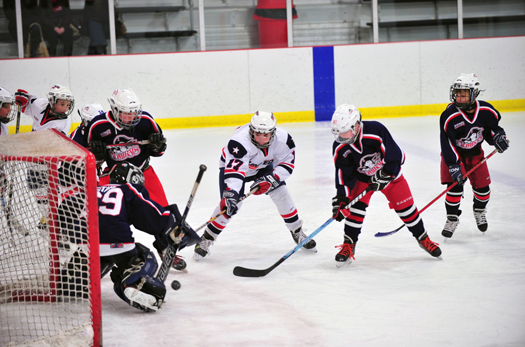 Maximum hockey development occurs through age-appropriate structure and content, and coaches like Mancini believe that certain practice techniques, including the use of small-area games, should be implemented at the Peewee level to help players develop hockey sense. “Small-area games where players are forced to make a high number of quick decisions in a short amount of time and space, and games that focus on odd-number play during which players must sort out their options and responsibilities, are highly effective,” Mancini noted. Ontario Hockey League’s Niagara Ice Dogs, have used the product throughout the season, recent adaptations make it appropriate for players 10 years old and up. In fact, USA Hockey Model Association Programs, including the Arvada (Colo.) Hockey Association, the Colorado Springs Amateur Hockey Association, the New Jersey Bandits and the Orchard Lake (Mich.) United Hockey Association recently provided The Hockey IntelliGym to their combined 18 Peewee teams. “I am a big believer in the IntelliGym and what it brings to all players at the Peewee age level and up,” added Mancini.